The corset is too tight around the back/shoulder area. The corset is the wrong height around the back/shoulder area. As you see, it's mostly a fit issue. Again, it doesn't mean there's something wrong with your body. The "backfat" itself may be flesh, or just loose skin, or the angle of your rib cage, but the corset is what needs changing, not your body. In my experience, a lot of corsets are cut too snug across the back, although your personal preference may be different than mine. Even if a corset is (ostensibly) the right measurement, it could be the wrong distribution, cutting in at the back but loose in the bust or ribs. If the height is off, the top edge of your corset may be at odds with your actual shoulder blades. What at a glance is flesh may actually be the bottom of your scapula popping over the top edge of your corset. Or your corset may be pushing up at a bit of skin, while your bra band pushes down. The first thing you might try, of course, is to simply loosen the top of the lacing. Many people believe that a lacing gap "has" to be totally parallel or the corset will break down. Luckily, that's not the case. A moderate A or V shaped gap is totally fine. See if you can loosen enough to smooth the back without making the front so loose it chafes or loses bust support. If your corset is an underbust, and you wear a bra, make sure your bra band isn't riding up. (Wearing a bra that fits well is helpful in this instance, naturally.) Tug your bra band down so that it encases the spill-prone flesh. Your corset may slightly overlap with the band. You may have to make this adjustment a couple of times in any given period of wear. If none of these tricks work for you, it may be time to think about customizing the fit. Corsetieres with a handmade product can personalize the pattern. With an in-person fitting, you may be able to have the distribution of the circumference shifted to the back. If not, see if they can raise the back slightly – perhaps an inch and a half, starting around the back of the underarm. Of course, with a bespoke fit, all these issues should be fully addressed! Within reason, anyway. Fit issues compound once you start piling on challenges like a low-back. With my pronounced rib tilt and soft shoulders, I opted for a chiffon drape to moderate the constraints of my wedding corset's dramatic back line. 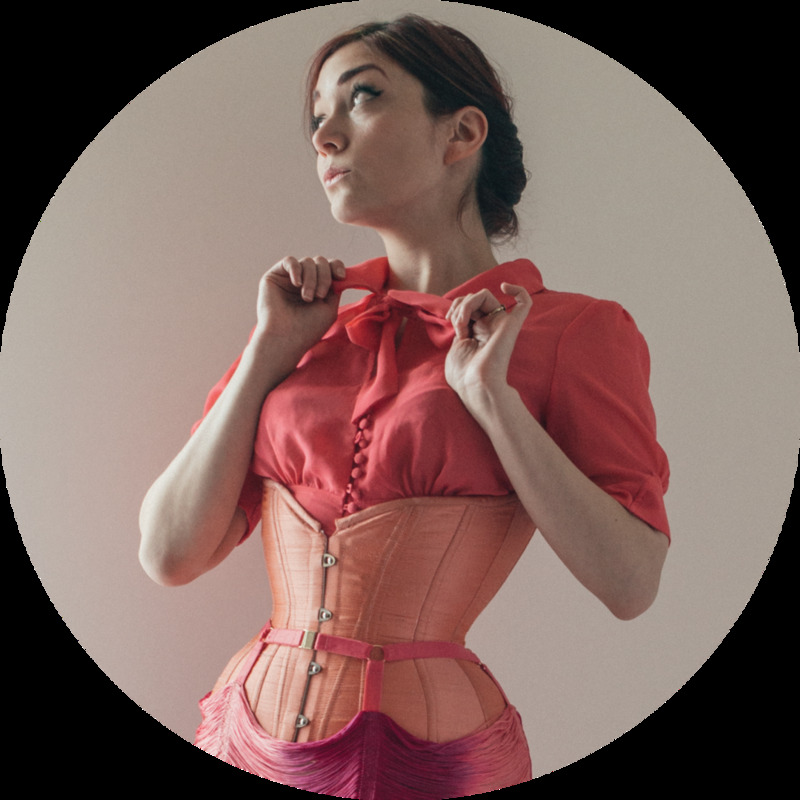 Do you have any other special tricks you use to get a smooth line around your corset?